FreshBooks – Cloud Accounting has just been updated today to support the iPad. It’s now a universal app designed for both iPad and iPhone. FreshBooks is an online service that provides invoicing, billing, and accounting services for small businesses. It seems like just the sort of service that needs a really good iPad app. FreshBooks – The Fastest Way To Track Time, Organize Expenses & Invoice Your Clients, Anytime, Anywhere. Cloud accounting puts your business in the palm of your hand. Never miss a second of billable time by using the time tracker. Easily capture expenses with your device’s built-in camera from a coffee shop or send an invoice right from a client’s office – all from your iPhone or iPad. Join over 5 million people using FreshBooks to make billing painless. I haven’t used FreshBooks myself as yet, but I have worked with several freelance consultants who use it – and it’s certainly makes payments easy and looks like quite a slick service. 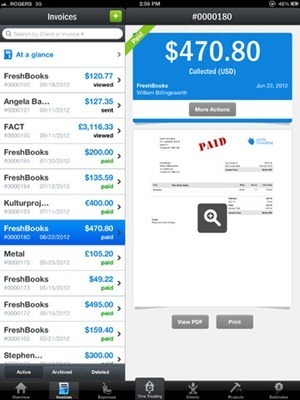 Here’s an App Store link for FreshBooks – Cloud Accounting; it’s a free app.